This bouquet looks freshly picked from the garden. 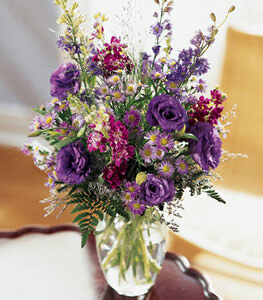 Purple blooms - stock, larkspur, and lisianthus - are arranged in a glass vase and accented with purple Monte Casino. A lovely arrangement for birthday, get well, or just because.